I think this may work..
Sunday night, Darrin treloar won his 11th national title, he was equal with Leigh Adams (solos) & Garry rush (sprint cars ) on 10 each, not any more. He did it the hard way, came through the semi final, had last pick in the final & flew from gate4. Current world champ warren Monson 2nd, world number 2 Mark plaisted 3rd & Sam Harrison on a bmw was 4 th. Track was sketchy but eventually came right. Good racing, no 1 got hurt, although my rider & myself tipped over another competitor out the start, he was fine. Big crowd for the weekend. Rob & Lou Wilson were there, haven't seen them in years. Spud (Andrew Buchanan ) did a wave to the crowd lap has he has pulled the pin. Nice bloke is spud. If I was technically smart I'd post the final but I ain't smart! If you have Facebook it should be on a page called dirty six racing or speedway sidecar 6. I will try & find it. Cheers duane. Aussie title qualifier at pioneer park last night, Moon, Headland, Harrison, Niesche, Bond, Bottrell, Firth, Rudloff. 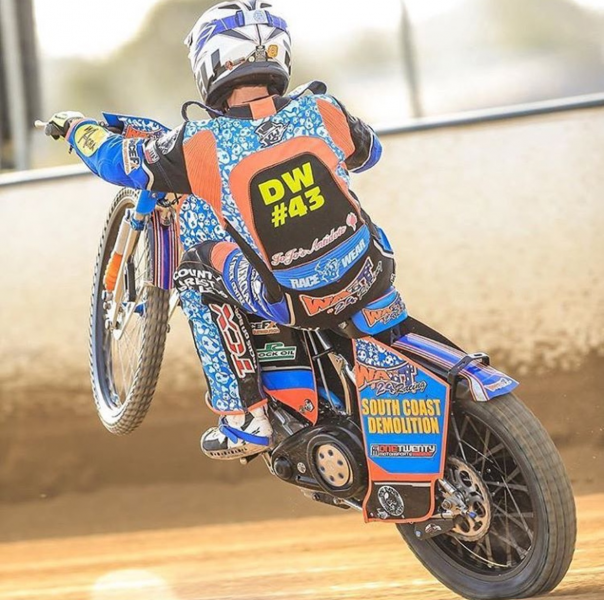 They join seeded riders tonight for the Aussie title, main draw tonight, Firth, Cohen, Golding, Rudloff, Buchanan, T Headland, Liptrott, Bond, Monson, Moon, Plaisted, Harrison, Bottrell, Niesche, Treloar, M Headland. Should b a great night o racing. Cheers Duane. Wazza & andrew also won the Oceania cup on Sunday at Gillman. Not a bad weekend for wolverine.. When we came back from England in 2015, we sent 3 motors back to Aussie with UPS (I think) & stripped 1 bike & put it in 2 suit cases. Can't remember the exact price for the motors to get back here but it wasn't that bad. From the rumours we hear,, that could be true Phil. If the GP ever comes back to Aussie, it should be at Gillman, the track is there, the pits are all concrete, bring in some temporary grandstands & your right to go. & i live in Qld..
Also if you go on Facebook, Australian speedway championship page, they are doing a live feed. That would b down to Leigh Adams. They have used the names all year as well as 2 other names from overseas. All with the blessing of the clubs. At least you guys get to watch it live, we get a delayed telecast today! According to FB, he has been taken off of life support & is breathing on his own.